1. Why are 2-tiered vented lockers that are extra wide a necessity? Vented lockers offer maximum airflow to the locker so that equipment can be aired out. They also allow for many people to use a set of lockers distributed against the wall at one time. Considering the amount of space the locker offers-everyone will find the extra room in a vented extra wide locker more convenient in storing their items. Smaller sporting equipment such as soccer, baseball, ice skating, or roller skating equipment fit conveniently into the extra wide vented lockers. Other equipment such as workout bags/small luggage, tennis shoes, towels, and other personal items used during your stay at the gym can also be stored. These lockers work well in school locker rooms! Warehouse or factory workers will be able to lock up their personal items and equipment in a safe spot as well. Prisons and jails can use them for their faculty/employees or in the locked cells themselves. 3. Why is it important to offer a locker such as this in my gym or athletic department? Athletes will appreciate your gym/facility so much that they’ll return and most will become regular customers-which brings the gym more income. Statistically speaking, regular customs bring more profit to a company then the customer that will only visit a few times. 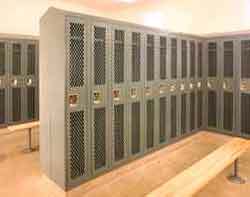 Don’t hesitate to make a recommendation/suggestion to a gym/facility regarding single tiered vented lockers. Fill out survey cards! 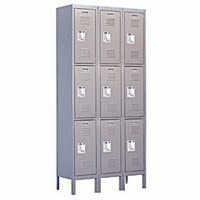 Make recommendations to other facilities about double tiered-extra wide lockers as well.